Yes, the Dell Compellent SC220 Chassis AND Drives are Generic! I found a great deal on eBay. A Dell Compellent SC220 chassis filled with 24 x 600GB 10K SAS disks for $350 including shipping. Obviously if you’re reading this years later that will seem like a terrible price, but as of now 600GB SAS drives are selling for about $30 each (used). So it’s roughly $720 worth of drives alone. The SC220 is basically an MD1220 in sheep’s clothing (though sheep are generally naked so who knows), and those are selling for about $120. Like I said, a great deal! 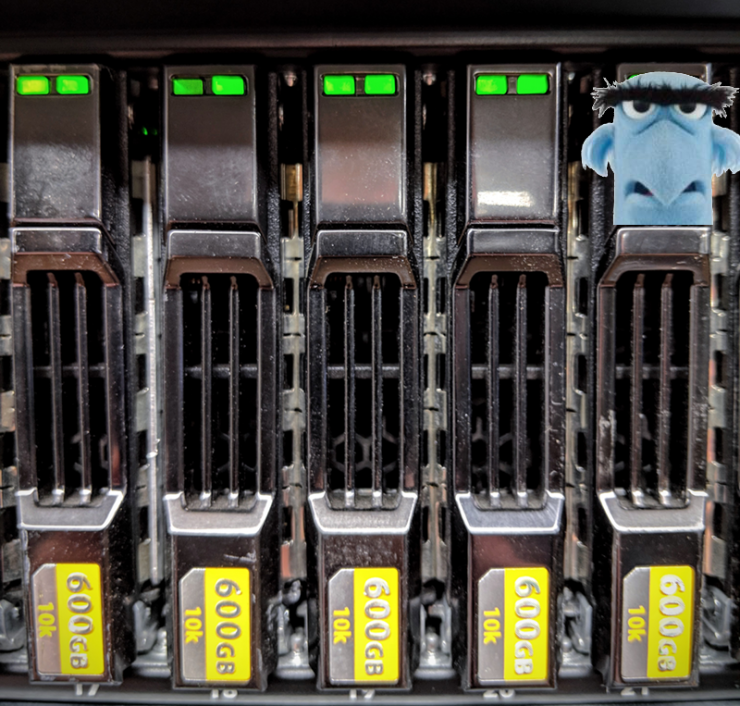 But there was one question that needed answering: Did the Dell-branded Compellent HDDs have some kind of special firmware that rendered them useless with a standard RAID or JBOD controller? I found posts online that told me the chassis was a safe bet, as it would essentially work as a DAS with any standard HBA or RAID controller. But, having had some bad luck accidentally ordering NetApp drives*, I was nervous about pulling the trigger on this particular auction. * Most — if not all — NetApp drives have 520-byte sectors and weird firmware which renders them incompatible with most SAS controllers. They’re usually the cheapest disks around, but that’s because they’re basically worthless for the average Joe/Joette. Cavalierly, I decided to scream “YOLO” to no one in particular and hit “Buy it Now”. 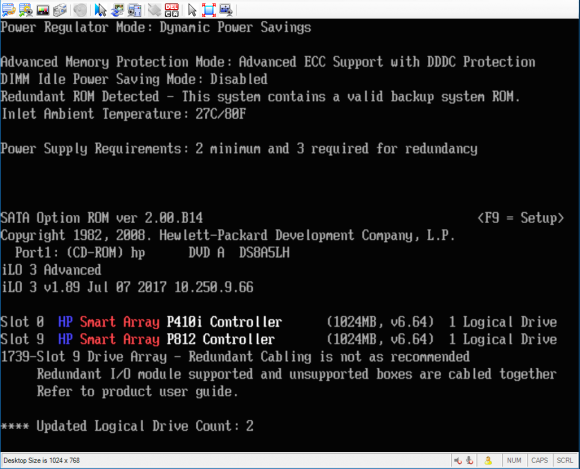 Shortly afterwards, I hooked up the SC220 as-shipped to an HP DL580 with a P812 controller and … it recognized the individual drives and let me create an array! The array works just fine. The error given has no effect on the operation of the array. The P812 also has an HP D2700 DAS shelf attached with redundant cabling, whereas the SC220 is single-cabled for testing. Because it’s a non-critical error, no user input is required to proceed. * OK, to be fair I can only personally vouch for the SC220 and my disks specifically. But I think it’s a safe bet that all Compellent stuff from that generation is basically the same. I do have an important caveat: The drive sleds/trays for the SC220 look like they should fit in an MD1220 (or other generic-ish Dell hardware). They do not. Both the SC220 and the MD1220 have tiny metal tabs on the bottom of each drive slot. Those tabs ride in the groove on the side of their respective sleds. The tabs and grooves are arranged in such a way that you cannot put Compellent drive trays in generic Dell hardware and you cannot put generic Dell trays in Compellent hardware. That’s not a big deal if you get an SC220 full of disks. But if you get a non- or partially-populated unit, you’ll need to find Compellent trays even if you’re using whatever disks you happen to have laying around. Either that, or you can try bending the chassis’ tabs out of the way. They’re just stamped into the metal, so presumably with enough leverage you could bend them down. I should also note that I’ve heard bad things about using Compellent head units (drive controllers) in a home lab or small-budget environment. You’ll probably run into licensing issues, and of course you’ll have to support proprietary software and hardware yourself. Plus the controllers will only support Compellent drives, and will complain vociferously about generic drives. I’m only endorsing the use of the disk shelves and disks themselves. The SC220 is on the top, with the connected DL580 at the bottom of the picture. 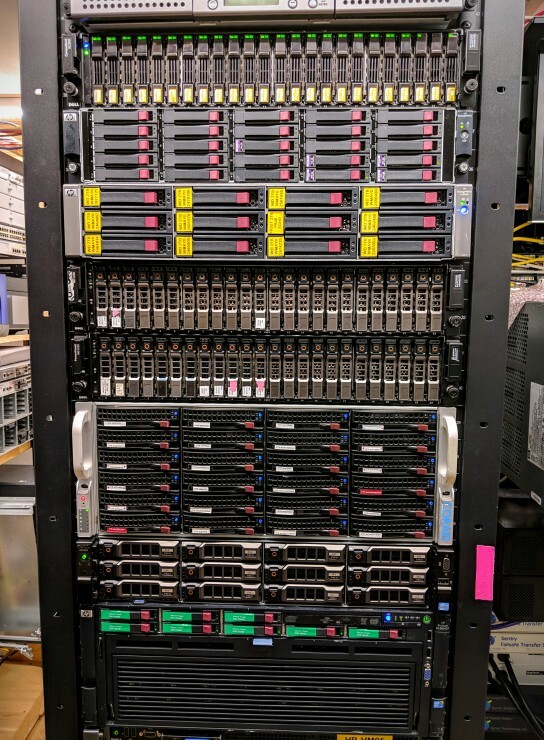 In between are a number of disks, including a 36-bay SuperMicro chassis and a Dell DR4100 (which is just a fully loaded R720xd at a cheaper price). I haven’t thought of this Muppet in a very long time (or perhaps ever), but Sam the Eagle looks like these drives. Dell Compellent SAS drive trays look like Sam the American Eagle.